NEW YORK – St. Bonaventure will play for the Atlantic 10 Conference tournament championship, despite beginning the season with a 4-10 record, despite trailing by 15 points in its semifinal matchup with Rhode Island. After a remarkable momentum swing that mirrored their season, the Bonnies are somehow just one win away from their first conference tournament title since 2012 and a second consecutive appearance in the NCAA Tournament. "It’s a microcosm of our whole year," St. Bonaventure coach Mark Schmidt said. "We’ve been down. We’ve struggled. Things weren’t looking good. But the kids, they believe." Fourth-seeded St. Bonaventure stormed back to defeat No. 8 Rhode Island, 68-51, in the conference semifinals on Saturday at the Barclays Center in Brooklyn, setting up a showdown with No. 6 Saint Louis, a 67-44 winner against No. 2 Davidson in the other semifinal, for the conference tournament championship at 1 p.m. Sunday. St. Bonaventure rallied from a five-point halftime deficit to defeat Saint Louis, 66-57, in the regular season finale on March 9 at the Reilly Center, the teams' only previous meeting this season. The Bonnies, winners of nine of their last 10 games, must win the title to advance to the NCAA field. "We’re playing for a conference championship," senior forward LaDarien Griffin said. "Everything is out the window. The last two games don’t mean anything. You’ve literally got 40 minutes to go right back to the NCAA Tournament, and once we step on that floor (Sunday), we’ll be ready." Early shooting woes plagued St. Bonaventure (18-15) once again – an unfortunate theme, lately – with the Bonnies hitting just 5 of their first 23 shots (14 percent), in part because of excellent defense by Rhode Island (18-15), in part because of poor shot selection. Bona’s struggles allowed Rhode Island to build a 15-point lead, up 29-14, with 4:08 remaining in the first half. But the Rams didn’t score again before intermission, going 0-for-4 with two turnovers, and completely collapsed in the second half, shooting just 28 percent (7 of 25) from the field. St. Bonaventure outscored Rhode Island 54-22 over the final 24 minutes, while turning a 15-point deficit into a 21-point lead, at 68-47, with 2:35 to play. That's a 36-point swing. "It’s the best defensive team that we’ve had since I’ve been the coach..." said Schmidt, in his 12th season at the helm. "It’s a mindset. We’re not a great offensive team. We haven’t been a great offensive team all season. But the staple, and the kids have figured it out, in order for us to win we’ve got to defend, and they’ve taken that and they’ve run with it." Bona freshman point guard Kyle Lofton had a team-high 23 points and five assists against Rhode Island, which had beaten the Bonnies in their previous matchup this year and had advanced to the conference title game in each of the last two seasons. Osun Osunniyi had a double-double, with 10 points, 11 rebounds and four blocks. Dominick Welch had 13 points, nine rebounds and three blocks, and Griffin added 13 points and six boards. St. Bonaventure hit 21 of 22 free throws in the game and shot 54.5 percent (12 for 22) in the second half, after its brutal performance to start the game. Griffin and fellow senior Courtney Stockard opened 0-for-10 shooting combined and were 1-for-12 at the half, with Stockard missing all seven of his shots. The all-conference forward was also caught driving the lane as the shot clock expired, ending another possession. Stockard finished the game just 1 of 11 shooting, but hit 7 of 8 free throws to finish with nine points. He added six rebounds, two assists and two steals. "I just told my teammates, ‘We’ve got to worry about defense. Shots are eventually going to fall,'" Lofton said. "Basketball is a game of runs, so I knew eventually our run would come. And then the crowd, also, they gave us good momentum towards the end." Cyril Langevine led the Rams with 15 points and nine rebounds. Jeff Dowtin added 12 points. The Bonnies’ comeback began with a 13-0 run, keyed by three 3s from Welch and Lofton, to claw to within 29-27 at halftime. "The last four, five minutes of the first half were critical," Schmidt said. "It gave us a lot of confidence. If we went into that halftime down double digits, it’d be a different ballgame." Bona’s surge continued into the second half. The Bonnies extended their run to 15-0, with Osunniyi’s tip-in tying the game at 29-29, and they continued pushing, with Bona outscoring Rhode Island, 20-4, to capture a 34-33 lead on a 3-pointer by Welch with 17:11 to play. Dowtin tied it at 41-41 with a 3 with 12:24 to go, but Griffin hit a pair of free throws to put Bona back on top. And on top is where the Bonnies remained. Minutes later, Stockard passed to Griffin for the slam and one, extending the Bonnies’ lead to 48-42 with 10:44 to play. 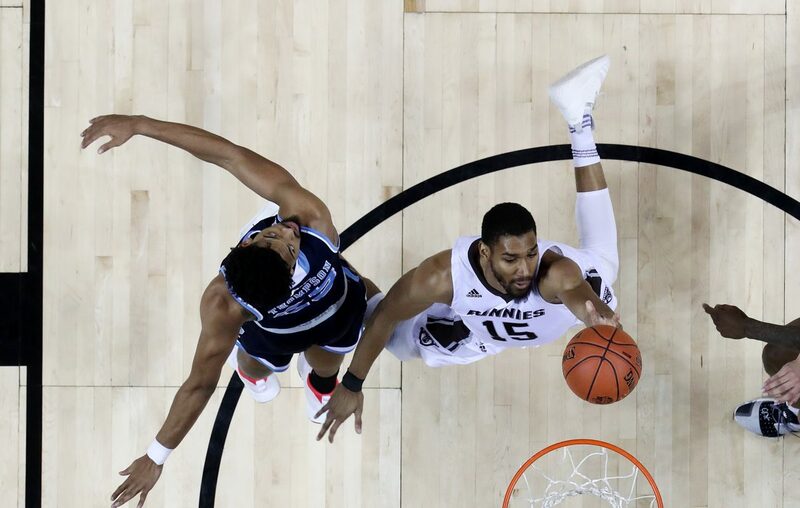 Rhode Island, held scoreless for another four-plus minute stretch in the second half, had no answers as the St. Bonaventure lead continued to grow. Stockard hit a pair of free throws to give Bona a 56-46 lead, its first double-digit advantage, with 5:25 remaining. Bona’s lead ballooned to 21 points. "We’re having fun," Osunniyi said, "but we know that we’re not done yet. We have one more game to win." Rhode Island appeared worn from playing its third game in three days. The Rams advanced to the semis with a 75-70 upset victory against regular season champ VCU on Friday. But they hit just three field goals over the final 12 minutes against Bona, two of them with the game well out of reach. The Rams had defeated the Bonnies, 75-63, in their only previous meeting this season, on Jan. 16 in Rhode Island. Bona, which earned a double bye into the quarterfinals, defeated George Mason, 68-57, Friday to reach the semifinals for a second consecutive season. But that’s where their conference tournament run ended a year ago. St. Bonaventure received an at-large bid into last season’s NCAA Tournament, the school’s seventh appearance in program history and the second under coach Mark Schmidt. With a victory on Sunday, the Bonnies will automatically qualify for the field. St. Bonaventure has never played in the NCAA tournament in consecutive seasons. Bona has a 4-4 record in A-10 semifinal games and a 1-2 record in the A-10 title game. The Bonnies last reached the A-10 championship game in 2012, when they defeated Xavier, 67-56, to win their first and only A-10 tournament title. Bona was also the fourth seed in the conference tournament that year.